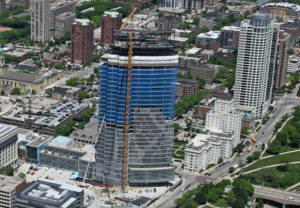 CSE was hired to fabricate and erect the structural steel for Northwestern Mutual's new $450 million, 32-story, 1.1 million square foot office tower and commons project. This project will be the largest office building in the state of Wisconsin. CSE’s scope on the project consisted of fabricating half of the over 8,000 tons of steel, erecting all the steel and furnishing and erecting the 1.1 million square feet of floor deck. Since our inception in 1980, Construction Supply & Erection, Inc. has had a single goal: To be the premier structural & architectural metals contractor in southeastern Wisconsin. Through the years, we have strived to attain this goal by offering a wide variety of products and services to handle projects both large and small.